There is something more than badminton in the life of Indian shuttle queen Saina Nehwal. That’s pooch love which this world badminton champ shares here. Saina Nehwal’s brilliance in badminton has made India proud for giving birth to such a young sportswoman of exceptional talent. Saina achieved her first shot to the fame when she ranked 2nd by Badminton World Federation in December 2010. She is the first Indian badminton player who bagged an Olympic medal which she accomplished at London Olympics 2012. In addition, Saina is the first Indian shuttler to win the World Junior Badminton Championship held at Pune in 2008 and the first Indian badminton ace who won a Super Series Tournament in 2009. Besides all her adoration and achievements in badminton, what she reveals here is her love for her pooches – Macho and Chopsi. First pet: Black-coloured Macho, who lived with us for good 13 years. Worst pet parenting moment: When Macho died, I was in China and I wept bitterly. What’s special about your pooch: I like them profusely. They are innocent and try to elevate your mood by playing with you even when you are not well. Special paw moments: It happens when I return from a foreign tour, Chopsi will not allow me to enter the house, unless I love and pet him for 10 to 15 minutes. Special moments that touch your heart: Chopsi sits outside my room till I come out. Daily pooch time: About half an hour everyday. What you love about your pooch: Their affection towards me. Sometimes, Chopsi licks my toe to show his love and will keep on doing it until I scold him. What your pooch loves about you: We are family. Exercise for your pooch: We take him out 4 times a day for 6 to 8 km walk daily. 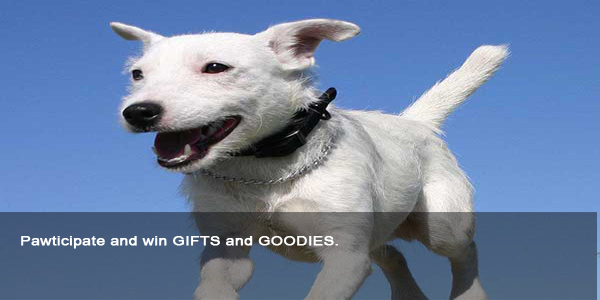 Your pet’s favourite dishes: Pedigree Dentastix, rice with curd, milk. Special treat for your dog: Tiny shoes for him. Message to pet parents: They keep us happy, it’s our responsibility to keep them happy too. A mother holds her child’s hand for just a short time, but holds her heart forever! On a cold February morning, I woke up early and greeted the sun rays by drawing the curtains apart. To my surprise, Timmie, a stray, who dwells in the abandoned plot in front of my house, was all cuddled up and was trying to hide something very precious. Needless to say, the next moment I found myself in that plot, my attachment to the stray drew me there! When I bent down to pat her, she revealed the secret. Six puffy balls, lay there, snuggling within each other, leaving me spell bound. The expression on Timmie’s face was, “So, how is the surprise, huh?’’ I had definitely loved the surprise and hugged her with joy. Their eyes were not yet open to this world, they had no idea about the miseries they could suffer in this human world. Tiny ears twitched with every wave of cold wind. Little paws made sure that they were close to their mother. Their tender bodies cuddled into each other for the warmth and security. I couldn’t stop myself, I picked up one of the cutest creatures made by god in the heaven. The innocence on his face was capturing. He left himself, relaxed on my palm and his tiny paws clutched to my thumb. In the meanwhile, Timmie tried her best to keep her pups comfortable by giving them her body warmth. Not only did I discover that the pups where heavenly and were a beautiful gift of god but also that the love and affection they shared with their mother was unconditional. I got to know that being a mother is the highest paid job in the world, since the payment is done in pure love. Only Timmie was the one on whom they could lean on. Only Timmie was the one with whom they could secure their nights. Only Timmie was the one who could teach them to fight for survival. It was amazing to witness this all. Gradually, the blooms disappeared and the naked trees stood under the hot sun. Giving way to the rains, the scorching heat bid goodbye. Those tendure, thumb-sized paws now had sharp nails and strength to run and play like hooligans! Anybody who enters that plot, be it the garbage man or labourer working in the next plot, or our help who is a regular supplier of milk to them, their excitement knows no bounds. One day, our help complained about her torn kurta and refused to serve the pups anymore. I had to sympathise with her but laughed my heart out when I was back into my room. Not anymore, are these young dogs limited to that plot now. They are familiar with every nook and corner of this colony. They follow the milk man and his leaking milk can, religiously, till he crosses the main gate of the colony. Any new comer dog in the colony has to take permit of these dogs otherwise it turns up into a mess. Initially, Timmie was their caretaker but now her sons and daughters make sure no one hurts their mother. And she rests undisturbed. Converting your passion into your profession is a dream for all…but a reality for a lucky few. Pet love has driven many enthusiasts to venture into diverse fields – medicine, writing, grooming, training, gourmet, photography, pet walkers, pet resorts, et al. Here are three experts in their own fields – all working for the love of the pets. Excerpts. Profession: Tailshots – captures your pet in a candid shoot. Traits: From childhood, she has always been an avid pet lover and has wanted it to be an active part of her life. Her fascination with photography which began as a hobby just after she finished school went on to become her choice in post graduation. Professional qualification: Post graduate in photography from Light & Life Academy, Tamil Nadu. 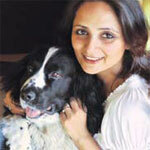 Pet pooch: Though Eshita does not have pet of her own, she plans to have one soon. Profession: Director, Shekhar Eye Research – offering prosthetic eyes. Traits: While doing custom-made artificial eyes for humans, he got many opportunities to make artificial eyes for horse, dogs and cats while in the USA. Pet pooch: A Pug for his daughter Shreeya. Inspiration: In the process of being a responsible pet parent, he got introduced to many veterinary doctors in India, who in turn, started referring cats and dogs to the center for prosthetic eyes. The offerings: Custom-made artificial eyes in Medical Grade PMMA and Medical Grade Silicon and specialty contact lenses for humans, horses, dogs and cats. Traits: Chef Ishmeet always had a passion for food and cooking. Even as a child he would experiment by mixing different kinds of foods with the resultant concoction turning into sumptuous meal. Professional qualifications: Being alumni of the Institute of Hotel Management, Mumbai and working with brands like Hyatt, JW Marriott and Kingfisher, he brings over 12 years of food-related experience along with him. Pet pooch: Harley was only two months old when Ishmeet and his wife adopted the stray from a construction site near Andheri. Inspiration: Months of research and talking to distributors and various pet parents made him start Harley’s Corner. The offerings: Harley’s Corner, which started as a home experiment, has today transformed into a business which has a whole gourmet menu which is not only different, but also healthy and nutritious. His menu today ranges from a variety of special to mighty meals to birthday cakes and dietary meals to suit various needs. http://www.dogsandpupsmagazine.com/wp-content/uploads/2013/11/Eshita1.jpg 88 165 Dogs and pups Magazine http://www.dogsandpupsmagazine.com/wp-content/uploads/2017/05/1254nal.jpg Dogs and pups Magazine2013-11-13 17:50:362014-02-07 17:46:41Love thy pet, Love thy profession! Stunning looks, extremely devoted to family and a sense of humour – can you ask for more? Briards are one of the most loving breeds of dogs…a sheer joy to be around! Here’s more on these wonderful dogs. 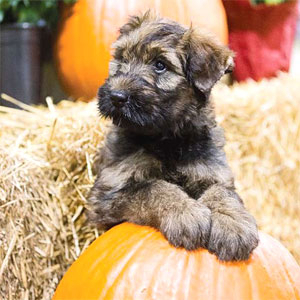 The Briard’s general appearance is a medium build, athletic, herding dog. Their proportions are slightly off-square. Their countenance is distinct with proud head carriage and agile quicksilver movement. Their glorious coat and athletic gliding feline-like movement are probably their two most distinct and notable physical traits. They have a double coat – a coarse and dry outer coat, which lies flat and falls in long wavy locks and a fine and tight undercoat. The Briard comes in various shades of tawny, black and gray and a combination of those colours. The breed also comes in dilution of the tawny and black although neither is considered desirable. The average height of males is 24-27 inches while that of females is 22-25 inches and they weigh around 35 kg. French emperor Napoleon, Thomas Jefferson and Lafayette all owned Briards. The dogs were used to run messages, detect mines, pick up trails, support commando actions, find the wounded and carry food and ammunition to the front lines. The Briard is a working dog at heart and was developed in the beginning mostly as a guard dog and anti-poacher dog. With the advent of farming and the increase of population, they became an all purpose farm dog providing help with many of the farm tasks such as driving stock down the road to the fields, keeping stock in open unfenced grazes, and guarding the farm and family. Therefore, their basic temperament is one of protectiveness and discriminant tendencies. They are a dog who prefers to know their limited circle of family and friends and is intensely devoted to them. They must be thoroughly and constantly socialised outside of the home to strangers and new people for their first year of life. The breed learns fast, has high drive to work and perform tasks, and has a developed sense of humour. They are a dog with strong opinions and an assertive nature. Briards are best in the hands of pet parents who are clear with setting and maintaining limits and boundaries. Briards are a wonderful dog to live with. They are affectionate and loving to their family and friends, devoted and kind. Most would rather lie on the feet of their pet parents and that would be their favourite activity. The breed is rarely destructive, if raised right with boundaries and limits. They do not tend to be active in the house and even when young have a very sensible outlook on living within the confines of a house. Their sense of humour is one of their most delightful traits. Briards are not usually a high energy breed. Exercise needs are the normal exercise given to any canine. Walking is good! As a young dog we especially feel it is good for them to get out and gallop and retrieve and get to stretch their legs at least few times a week. Many Briards love to retrieve balls, sticks and frisbees. The breed loves games of chase and hide & seek. Tug of war with a stuffed toy is often a favourite, although it is discouraged from dogs living with young children. Puppy care is no different that sound raising practices of any growing medium size breed. We suggest a crate for confinement when no one is home or watching. An excellent quality dog food is a must and of course fresh water. Briards are easy to train, easy to housebreak and easy to bond with. The breed’s socialisation needs are extremely high. The new pet parent must be aware of the high maintenance of this breed. The grooming needs are very demanding, being a fully and heavy coated breed. The socialisation requirements outside of the home are even higher and cannot be treated lightly. There is no shortcut to proper care and raising with constant socialisation away from home. Briards are not a breed for overly busy people unless the dog can be included in every aspect of the busy lifestyle which can be a plus for socialisation. The coat must be line brushed on every inch at least once a week using a pin brush and slicker. This process can take 1-5 hours, depending on the age of the dog and quality of the coat. Weekly bathing and blow drying with line brushing like all drop coat breeds keep the coat clean and mat free. Briards do not really shed hair. But hair does die. Short coat breeds shed that dead hair and it falls all around on the floor, furniture and clothing. Long coat breeds have the live coat entangle with the dead hair which is what creates mats. The brushing process removes the dead hair when it is not shed and prevents the dead hair tangling into mats. Most responsible breeders screen for hip dysplasia by x-raying. The breed has gastric torsion which most likely has some hereditary basis. The breed is also screened for Stationery Night Blindness (SNB) with a DNA test. SNB is inherited through recessive genes. As breeders we also screen for eye disease health through annual visits to veterinary ophthalmologists. There is definitely an inherited basis for poor temperaments with some dogs displaying genetically inherited dog or people aggression. When considering the Briard, first make sure the breed will fit your lifestyle. They need you to be comfortable at being their leader and in charge of reinforcing consistent boundaries and rules. Briard is not a breed for a person looking for an easy pet. They are a lot of work when you include the grooming needs and socialisation requirements. If you are not afraid of the work involved, there is not a more devoted, demonstrative or loving pet on earth. (Terry Miller of Deja Vu Briards is based in Cleveland, Ohio. She is a dog behaviourist. Deja Vu Briards is home to almost 300 champions and holds every record for Briards. Deja Vu Briards is the home of the top winning male and female of all time and the top sire and dam of all time. Deja Vu dogs are exhibited all around the world and have won more Briard Club of America national specialties and group placements at the famous Westminster Kennel Club than any Briard kennel in history). Ruff – In the popular comic Dennis the Menace, Ruff is Dennis’ big, lovable, faithful dog, who follows him everywhere. Reno – In the film Top Dog, Reno is a police dog, whose handler was killed. He teams up with Wilder to investigate a plot by domestic terrorists to attack a conference on unity. Cho Cho – In the movie The Karate Dog, Cho Cho is a dog who can speak to humans and is an expert in martial arts. Sam the Sheep dog – In cartoon series Looney Tunes, Sam the sheepdog, is a large Briard Sheepdog with white or tan fur and mop of red hair that usually covers his eyes. He very rarely runs and tends to be sedentary in his movements. http://www.dogsandpupsmagazine.com/wp-content/uploads/2013/08/Love-in-a-fur-ball-2.jpg 133 250 Dogs and pups Magazine http://www.dogsandpupsmagazine.com/wp-content/uploads/2017/05/1254nal.jpg Dogs and pups Magazine2013-05-18 12:59:492014-02-07 17:40:31Love in a fur ball! New Year is not just the beginning of a new calendar, but it is much more – new hopes, new aspirations, new resolutions, etc – in fact, it gives us an opportunity to jump with joy and start afresh. A UK survey was recently conducted to find how important pets are for pooch lovers, especially women and there were some interesting findings. As many as 25 percent women would dump a man if their pet did not like him…. hmmm… whoever said women can be wooed with hearts and chocolates should think again! And 50 percent women say their first ‘hello’ to their pet when they are back home… no wonder why pets are so excited to welcome them at the door! Not only this, 33 percent of women would sleep on the floor besides their sick pets. Other findings indicate that almost half of the pet parents are ready to incur any expense on their sick pets and 60 percent celebrate events like birthdays, Valentine’s, Mother’s and Father’s Days with their pets. We recently conducted an opinion poll on Facebook on a select group of women (pet parents) who are dedicated to their furry babies and here’s what we found: Almost 100 percent women say ‘hello’ to their pooches first when they get home… there are no two answers about it. Similarly, all we interacted agreed that they love to talk to their paw friends. We also posted a question wherein we asked if they would sleep on the floor if their pet was ill and we got some really interesting responses. As Stephen Game shares, “Ill or not, I only sleep on the floor… I sleep on the floor for them and them only!” While, Manesh Krishna, Vatsala Shukla, Alka Paul, Tanvi Nagpal and Sahana Saran say that their pets sleep with them every day on their beds. Now, that’s what we call pooch love… kudos to all our pet parents! Let’s all woof into this New Year 2013 and Sparkle is refusing to step out for walks as temperatures are dipping in northern India. Take care! http://www.dogsandpupsmagazine.com/wp-content/uploads/2017/05/1254nal.jpg 0 0 Dogs and pups Magazine http://www.dogsandpupsmagazine.com/wp-content/uploads/2017/05/1254nal.jpg Dogs and pups Magazine2013-01-20 14:54:162014-02-07 18:07:39Jump with joy – with Pooch love! It was a heavenly sight; six adorable, puffy balls were rolling on each other. The proud mother was licking them, turn by turn. Amongst these cute creatures was lying our bundle of joy – Rossie! My uncle instantly picked her up and asked his friend, if he could give this female Pomeranian to him, forever. Willingly, he agreed. Rossie had a lusturous black coat, sprawling big eyes, button-like nose and a charming attitude. My grandmother welcomed this newcomer as all her children had grown up and she had nobody to get involved in. With the time, Rossie became her shadow; to such an extent that grandma had to take her to her relatives’ house to Moradabad, whenever she visited them. As time passed, my grandmother’s hair turned grey and Rossie’s coat turned dull. What remained constant was their unconditional love. Finally, the black day arrived. Rossie breathed her last in my grandmother’s lap. My grief-stricken grandmother did not cook or eat for days. Her death had created a void in every family member’s life that was hard to fill. Since my early childhood, I had been hearing about Rossie through my grandmother. Being an adamant animal lover, somewhere inside my heart, I felt connected to Rossie deeply. I was moved by the touching demise of this pet and was determined to bring a new companion for myself and my grandmother and today we are blessed with Mischief. Though he cannot fill the void created by Rossie, he has become an inseparable part of our life. What do you look for when you decide to bring home a pet? Probably, unconditional love, affection, companionship and experiences you would cherish all your life….! Are all these qualities gender-specific? No, then why do people prefer male dogs as against females? This has been going on for ages…when it comes to breeding of dogs, then female pups are adopted, else males are the first choice. Why? and breeders need to say about this issue. Srikant of Pets and Pet Needs shares that pet parents tell him that they do not want female pups as they come in heat and it is difficult to manage her as they will dirty the place. Besides, the tension of stray dogs causing trouble cannot be ruled out as well. He also adds one needs to devote time, effort and money to take care of a pregnant dog and it is a big responsibility to find loving homes for the pups. In fact, these problems are very superficial. “Education is must for all pet parents if they are first time pet parents, it improves the bond between the pet and removes taboos heard which are basically wrong information gathered. Proper management and advice from their veterinarians can help pet parents deal with heat cycles,” tells Dr Hatekar. “Besides, the normal cycle of female dogs comes once in six months, which may last 18 to 20 days. Females may get pseudo-pregnant sometimes after the heat period is over and they may start lactating during this period,” says Dr Hatekar. But this is hardly an issue. Pet parents can spay their dogs i.e. remove ovaries and uterus if they don’t intend to breed them. “This will stop the biannual cycle and prevent the female from coming in heat. Spaying also reduces the chances of mammary tumours and females become better pets after sterilising,” he adds. “The female may be spayed (sterilised) after reaching maturity (after one year of age). It is always preferable not to spay or neuter an immature dog. Alternatively, if the pet parent is careful whenever the female comes into season (every 6 months) not to allow her to come in contact with any male dog, they can avoid the risk of unwanted pregnancy,” adds Dr Javeri. Female dogs are more loving than the males and they are more emotional. “They are as good as males in guarding and they are excellent companions to children in the house. “They can be trained easily since they are more focused,” says Dr Hatekar. Dr Freya Javeri adds that there are particularly no problems related to female dogs. “In fact females tend to be more affectionate and hence easier to train and better with children than male dogs. They are less likely to become dominant; hence there is a lower risk of dominant aggression in female dogs. Being more affectionate, they are easier to train and very good with young children and elderly family members. They will, however, perform the same duties as a male dog, like guarding the family and home. On the other hand, male dogs need more firm handling in order to discipline them. Male dogs are also more distracted whenever there is a female dog in season in the neighbourhood, which includes stray females, at which time they may try to run out to look for the female (and risk getting hit by cars), may stop eating for a few days, or become difficult to handle,” she shares. While, Dr Javeri recommends female pups to pet parents who come to her clinic. “However, most of them still opt for a male dog. But, it is worth mentioning that, pet parents of pure-bred male dogs will always find it difficult to find a mate for their dog because not everyone with a female will want to breed from their dog, leaving a majority of male dogs without being bred throughout life,” she says. Vishwa Chaitanya, student of veterinary from Pondicherry, adds that pet parents who are knowledgeable about dogs may prefer female pups as they are more docile than males and are more obedient when compared to male dogs. Next time, you are adopting a pet, look for the bundle of joy who steals your heart away… male or female – does it really matter? http://www.dogsandpupsmagazine.com/wp-content/uploads/2012/09/250x225-images-stories-issue-sep12-0151.jpg 134 250 Dogs and pups Magazine http://www.dogsandpupsmagazine.com/wp-content/uploads/2017/05/1254nal.jpg Dogs and pups Magazine2012-09-19 05:13:292014-02-07 17:20:04Female vs Male : Is love gender specific?